If you're willing to do a bit of simple searching, you'll quickly be able to find all the free cake designs you can handle. Amateur and professional bakers tend to enjoy sharing their hobbies and careers with others, and though they may be secretive about their recipes, photos and instructions for their cakes are available in many different places. The easiest way to find free cake designs is by doing a Web search. If you aren't sure what kind of design you'd like, try general search terms such as "cake decorating" or "cake design." Filtering image results rather than hits from the Web will let you quickly glance at each design and decide if you'd like to visit the site from which it came. You can find more specific designs if you have a clear idea in mind of how you want to decorate your cake. 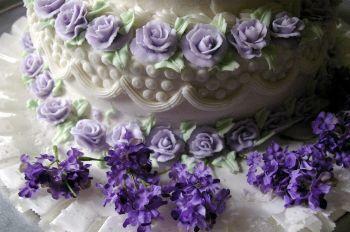 For example, searching for "tier cake" or "tier cake decorating" will return results for stacked cakes. "Topsy-turvy cakes" will give results for stacked cakes that are deliberately lopsided, "sculpture cakes" are made to look like works of art, and "novelty cakes" that exhibit unusual, eye-catching designs. Another way to search is to think of the occasion for which you're decorating. Searching for "April Fools' cakes" is more likely to yield specific results than simply searching for "funny cake designs." Work with what you have! By creating a stencil or pattern design, you can build off existing cake-decorating ideas to form a truly unique cake. You can push frosting or icing through sturdy stencils made of cardboard or stiff paper and use cookie cutters to cut out precise designs from fondant. Some Web sites and books even offer detailed patterns or grids that can be traced, cut out, and used as cake designs. One of the best ways to get a lot of cake decorating and design ideas is to set aside some time to look through a gallery. Clicking through pictures is especially useful if you're not sure what kind of cake you want, because galleries present a huge variety and depth of ideas. 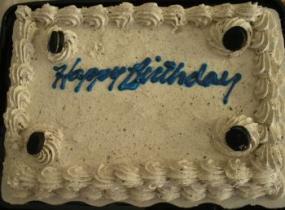 Often, websites will list instructions to go along with gallery photos for specific cakes. Looking at how someone else decorated the cake you see can help you get your own ideas and figure out how to make modifications or adjustments on the cake to fit the supplies you have available. Web pages or books that provide tips and techniques for decorating are great sources of free designs. By experimenting with frosting tips and testing different techniques, you can find unique looks that would suit a variety of cakes. Go to your local bakery or a well-known bakery in your neighborhood and take a look at their cakes. If you see a design that intrigues you, ask the baker to tell you more about it or give you some advice about how to decorate in a similar way. Contact a culinary or baking school in your area and ask if you can come view cakes that the students make. You may have to wait for certain times of the year to come around before you can do this, but it's a good way to see a lot of designs in person and get a better idea for how they're put together. Libraries are an excellent source of free information on all subjects. Use the library catalog or ask a librarian to help you find books and videos on cake decorating. Many cookbooks also have full-color photographs of cake designs that can help spur your own ideas. If you're looking for a particular book that you'd prefer not to buy, ask your library if they can get it for you using ILL (interlibrary loan) or special-order it for you.